The idea of toking up while on vacation in Sin City sounds like a dream. But, there are a few things you should know about Las Vegas cannabis laws. Last November, Nevada became one of the eight states that allowed for recreational cannabis use when residents voted ‘yes’ on the Nevada Marijuana Legalization Initiative (also referred to as Question 2). Throughout the past year, Las Vegas has seen medical marijuana dispensaries popping up all over. But with recreational now becoming a reality, excitement among residents and tourists is mounting. For vacationers, the idea of toking up while on vacation in Sin City sounds like a dream. But, there are a few things you should know about Nevada’s marijuana laws before you go. As of Jan. 1, cannabis can only be smoked or consumed on private property and/or a private residence. Nevada’s Green Ribbon panel, an advocacy group who makes recommendations to the state to increase cannabis access, has introduced policies that would make public marijuana consumption a viable choice. As of now, alcohol consumption is legal while walking the Las Vegas Strip and throughout strip casinos. But gaming establishments will continue to ban cannabis use in their hotels, casinos, parking structures, etc. until further notice. It is still illegal to sell or buy cannabis from anywhere other than a licensed dispensary. However, once the bud is in your possession, police can’t track you to the source. Regulators and lawmakers are still in the process of developing taxing structures for the sale of the plant. For Nevadans who aren’t medical cardholders, they’re going to have to wait until the retail stores are up and running before they can legally buy marijuana here. The ballot initiative gives us until January 2018, but we’re aiming to have regulations in place that allow us to license those retail stores by this summer. According to recent reports, the fastest course of action will be to sell recreational weed within medical marijuana dispensaries that are already operating, rather than offering up permits for separate shops. The Green Ribbon Panel is hopeful that shops will be able to offer recreational shoppers the same inventory as medical, just at a higher tax rate. Unlike with medical marijuana, Nevada is not implementing a registry that tracks how much recreational marijuana is purchased. However, with the legal possession limit allowing any amount up to 1 ounce, law enforcement can indeed make an arrest if you’re caught carrying more than that. Medical marijuana patients can carry up to 2.5 ounces. Whichever you choose, please be sure to contact the dispensary ahead of time to ensure that they will accept your out-of-state documentation. 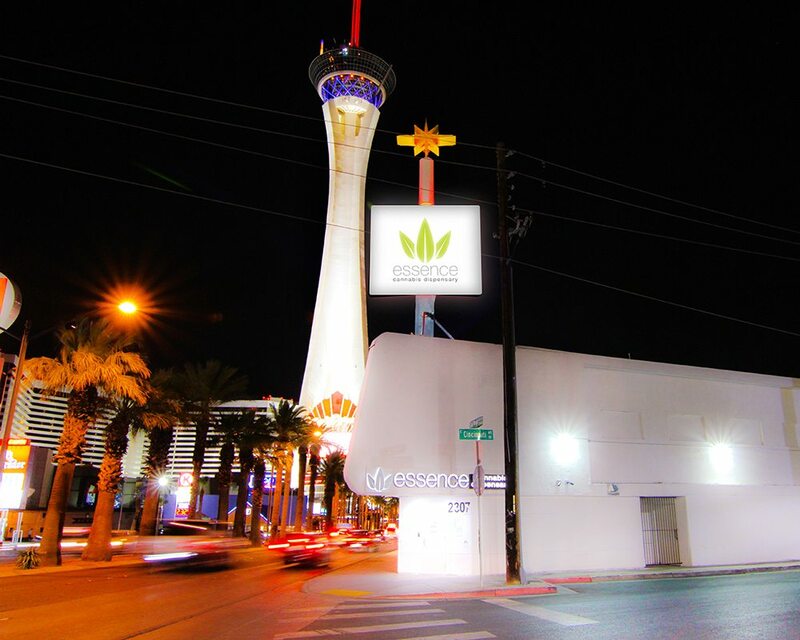 Essence Cannabis Dispensary accepts out-of-state doctor’s recommendations and is the only medical marijuana dispensary located directly on the Strip for now. Blum dispensary (founded in Oakland, CA), also accepts out-of-state MMJ cards and doctor’s recommendations and is located near the Strip. The Clinic, across from the Palms Hotel & Casino accepts California doctor’s recommendations as well. Medical marijuana patient or otherwise, no motorist can have marijuana metabolites present in their system while driving. If law enforcement detects that you have been consuming weed (the smell, visible nugs in your vehicle, bloodshot eyes, etc), you can be arrested for DUI and be subject to a blood test. Marijuana laws will continue to evolve here in the Silver State. Cannabis smoking lounges and a host of other ideas are being proposed at the moment. But for now, edibles and vapes could be your best options for discreet weed consumption in Vegas. If you know of someone who lives here and likes to toke, even better.